We offer personal service wedding flowers. All locally grown flowers, giving your wedding a unique sense of place and style you will get nowhere else. We describe ourselves as seasonal, locally grown, vintage, rustic, farm fresh, abundant, natural, organic. As a part of the 'Slow Flowers' movement we are members of the Specialty Cut Flower Growers Association, Field to Vase and Farmer Florist groups. Only 20% of flowers used are grown in this country, we are working very hard to change that. We hope you will support us. Looking for Locally and Sustainably grown flowers? Our growing practices have changed very little since we started in 1986. So we don't get too excited over buzzwords like 'sustainable'. However, that is how we grow everything! We were green before there was another meaning to 'Green'. We grow all our own flowers using organic methods, although we've never filled out the paperwork to get certified. Our vegetables are self- certified organic. Our flowers are pesticide free. We start our own vegetable transplants, cut flower seedlings and most perennials. All without a heated greenhouse. There are no factory hothouse flowers here. We choose flowers that fit into this environment. We own and care for 100 acres. Farming on only 5 acres, and live on less than 2. The rest of our 100 acres are in woodland, some are in old fields, used to attract beneficial insects and birds. All are lightly managed for non-game wildlife, especially birds. We spend time every year removing invasive non-native plants, along with habitat management for a few rare species. We hope you will support our farm, for our conservation mission, as well as our great flowers and plants. We are a husband and wife team working to bring you the best seasonal, locally grown fresh cut flowers in the High Country. Susan Wright has a M.A. in biology from Appalachian State University. In 1986, she developed Shady Grove Gardens & Nursery as a Landscape Gardener, growing her own perennials for Designs and installations. Shady Grove Garden's main business is now growing and designing cut flowers for the High Country region of NW North Carolina. Susan is the bridal consultant and floral designer. At the nursery, she is the perennial and seedling grower. She now balances wedding designs and sales with pest and disease control, potting, seeding, watering and developing each years product mix. Susan, works directly with the bride on colors, style and design needs. Susan is your contact person for all orders. ﻿﻿Brent Cochran﻿﻿ has an M.B.A. from Appalachian State University. He is in charge of the farm on Peak Road in Creston, NC (Ashe County). He manages our surrounding forest for conservation and non-game wildlife, in addition to the cultivated acres. Brent is head planter, flower cutter and postharvest guru. Brent is a full time flower grower. Presently, he is farming 5 acres of shrubs, perennials, bulbs, greenhouse and annuals. Links: http://www.shady-grove-gardens.blogspot.com - for up to date photos and flower information including seasonal flower charts by color and week. How to Order: Click Here or call Susan@<#828-297-4098>. We consider all bucket orders DIY, consults are not included in the price. However, feel free to call with questions. For Wedding floral designs please call or or use this contact form to set up an appointment. We'll need some details to provide you with an estimate. We work with many brides from out of town. Ask for our floral design plan. Or click here. It's a simple form for us to collect all your information. It acts as our contract. Looking for specific flowers or colors for your special day? Check the charts at the top of our Blog: www.shady-grove-gardens.blogspot.com Our locally grown seasonal flowers are listed by color and weeks available. Order buckets, bunches or let us design something beautiful for you. Thank-you for considering locally grown flowers and supporting local farmers! With minor care your flowers will be spectacular! We appreciate your order and are pleased to help you have a great wedding! Payment: We prefer checks for the initial deposit. We also take Credit Cards along with checks and cash for the balance 4 weeks before your wedding. To insure a date or any order of flowers, sooner is better. We're finding a few dates each summer month to be very popular, with specific colors being popular each month. So.... place you order with 1/2 deposit well ahead of your wedding. Sorry ladies, just telling me you want to use our flowers doesn't get you on the calendar. As ‘Speciality Cut Flower Growers’, we sustainably grow the flowers we sell. We produce hundreds of different seasonal flowers. Offering wildflowers, rustic, vintage or a touch of traditional in our designs. Our fresh mountain flowers are always styled uniquely for you. All these flowers will hold up well for weddings and receptions. Our flowers are seasonal. Our availability changes every week throughout the season, therefore we work with your color choices rather than very specific flower choices. 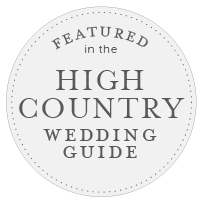 Local and Seasonal with give you a very unique high country wedding. We offer flowers April- November. For the best value, and unique designs, use seasonal, locally grown flowers. The wedding party’s personal flowers. If you want to do-it-all yourself you'll be interested in our flowers by the bucketful. Flowers are sold by the bucketful @ $85, these are mixed colors and flowers, grower's choice. Specific color requests (May & October- flowers) are $100. We work hard to get you a combination of special flowers, filler and line flowers. (mixed buckets, all versions, are growers choice 6-8 bunches or 70-80 stems). Greenery only buckets are $80. For a specific flower or color. These would include many of the larger flowers such as hydrangeas, peonies, sunflowers, viburnums and lilacs. We also put dahlias and zinnias in the buckets. These can also be ordered by the bunch for a specific color. Special bulk orders for standard florist flowers: Wanting some more traditional items.